I was wondering if anyone in the Mackay area shares my passion for Geraniums. We are lucky in Mackay,a few kilometres north and it becomes a lot warmer and more humid. I live inland from Mackay, although warmer during the hot months it is a lot less humid. I would love to hear from anyone as I am new to this addictive habit called gardening. Hi. I live in central qld too. I love the ivies and grow them in large terracotta pots. I feed regularly and give them a dose of anti rot if they have been wet for awhile. They always seem to be flowering as long as I remember to feed them. They are my favourite pot plants as they can bear the heat. I have lost a few since my last post. Root Rot, but not from overwater,just the humidity. I have found a very hardy beautiful double in a garden in Brisbane. I took a cutting and bingo nothing seems to kill it. This is my first day on this forum site and you replied straight away! Have no idea what I am doing but will go with the flow. First - I am sorry to hear you have lost some of your geraniums. It is probably too dry where I am to have that trouble but I appreciate how maddening/disappointing it is to lose a plant - especially a favourite. I spray anything prone to mildew in my garden regularly with diluted milk. Works. Only thing I can suggest other than that is not to water overhead but you probably know that already. I never prune during the summer either, no matter how tempted. Hope that helps. Good luck and keep me posted. I recently bought the most lovely ivy geranium I've ever seen; it's a deep red double flowering type (looks almost black in some lights), which at the moment is planted into a hanging pot, but I plan to take cuttings soon to plant out against a 1m wire fence between me and the neighbour. Only problem is that the fence runs east/west, and the neighbour is on the northern side of it...do you think I'll get any flowers blooming on the southern side? I don't see why your geranium wouldn't flower up against a wire fence unless in shade. They are a bit like roses and love at least 6 hours sun but unless planted under a tree or something it should flower beautifully for you. Love to see a photo of it one day. As Marilyn says, your geranium should flower just fine. I have a red ivy geranium that I planted next to an old tree stump in a dappled part of the garden and it's flowering quite well even though it hasn't been planted very long. Will try and remember to take a photo for you. What is Anti Rot, it seems like a good idea. well, it will definitely get more than 6 hours of sun a day; there are a couple of bush roses planted on the northern side of that bit of fence but they're fairly open bushes, and my neighbour keeps them pretty well trimmed. katharine wrote: What is Anti Rot, it seems like a good idea. If you click on the Yates icon on the GE homepage you will see Anti-rot listed there with some information, more would probably be available on the Yates site. 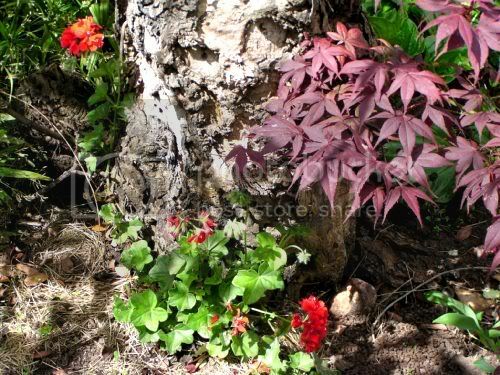 Here is my little ivy geranium flowering well in dappled shade and it's on the western side of the dead tree stump with a flowering cherry overhanging it, so I don't think you will have any problems with yours flowering on your boundary fence. I believe that ivies can manage better in part shade than other varieties - is that true? Do you know the name of your pretty little one Marrion? What do you feed it? Marilyn wrote: I believe that ivies can manage better in part shade than other varieties - is that true? Not sure about the shade but mine certainly seems to be OK there. It's an ivy-leafed Pelargonium hybrid "Royal Red" and is supposed to be vigorous. The label also stated "full sun" and "frost tender". It has been fed when surrounding plants were fed with either blood and bone, dynamic lifter or some well rotted cow manure. It will be interesting to see how it fares in our Tassie winter, although we are in a frost-free area. When I was living in Tassie -south Hobart ,I grew ivy Geraniums and never had a problem with frost is this maybe with the newer ones. "When everything is upside down,rest if you must but don't quit"
I grow them well. my favourites are the Ivy Gernaiums and the Regal Pelargoniums. Such amazing colours. Grandma has always grown gernaiums with so much ease. She never waters them and still gets more flowers than me. I tell 'ya, you kill them with kindness. You are so right Pokie, I have them on my fenceline and some in a paddock that really are neglected but they live without water all summer which is a huge thing here,most I have transplanted into kinder circumstances and eventually will move all of them.I was given a piece of a climbing double pink that I admired in a local street and have them growing in baskets in the shadehouse,they seem to be doing well there too .Hardy beggars geraniums. One of the hardiest plants I know.